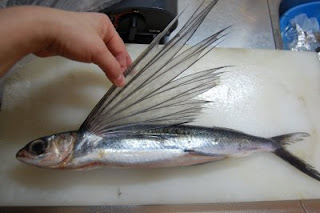 The arrival of ayu is a sign that summer has arrived. Simply salted and grilled is the most popular way of serving this tender-fleshed fish. Kawahagi is a funny looking fish. The skin is so thick, hence the name kawahagi, or leather jacket. We love this fish as sashimi. If we’re lucky, the fresh fish will have its liver, which we mix with ponzu and serve with the sashimi. Katsuo simply seared on the edges, sliced thickly, and served with some soy sauce and garlic. Katsuo tataki is particularly nice if you can garnish it with fresh myoga. Karei is lovely when deep-fried whole, a dish called karei no kara-age. As for octopus, which is one of my favorite seafood if cooked properly, there are so many recipes. Shinji and I visited an octopus-processing factory and the staff there suggested putting boiled octopus on top of Japanese curry. It’s so easy as boiled octopus is often sold in Japanese supermarkets. And, it’s yummy. Suzuki is a nice fish to sauté meuniere style. Tobiuo we love as sashimi. As for saba, there are so many different preparations, including simmered in miso, salted and grilled, deep-fried, or sautéed. And, while wakame is not a seafood, this sea vegetable is in season now. If you have the opportunity to have some you are in for a treat to enjoy its texture and flavor this time of year. Your blog is very useful. I am traveling to Tokyo next Monday and am looking for a food guide to take me around during the day. Any suggestions?